The COD World League’s (CWL) first tournament of the year, CWL Las Vegas Open, is rapidly approaching. The tournament will take place from December 7, 2018 to December 9, 2018. 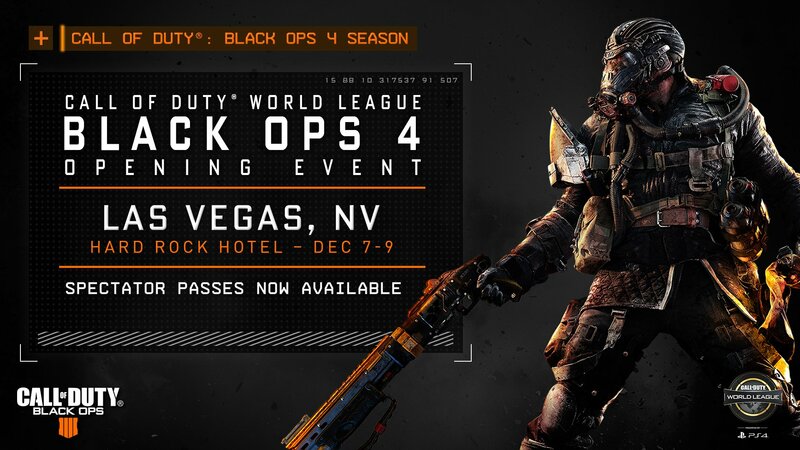 The tournament is the first CWL tournament of Call of Duty Black Ops 4, and the first 5v5 CWL LAN tournament to date. The tournament will feature a live audience and a prize pool of $250,000. The pool play draw will be live streamed on the official Call of Duty Twitch channel. The live pool play draw will start at 10:00 AM PST on November 21, 2018. Pool play will feature 4 pools with 5 teams each for a total of 20 teams. Of those teams, 12 teams are from the 2018 CWL Pro League Stage 2, 4 teams will be play-in teams, and 4 teams from open bracket. Pool play will be best of 5 series. The top 2 teams from each pool will be placed into the championship winners round 1 bracket. The championship bracket will be best of 5 series, double elimination matches. The top 4 placing teams in the championship bracket will qualify for the 2019 Call of Duty Pro League. The top 32 teams from the championship bracket will qualify for the 2019 CWL Pro League Plan-in tournament.